This post comes from our friends at Movie Mondays and I wanted to share - it's a good one! If you write appeal letters, fundraising newsletters, or other donor communications, this video is a MUST for you to see. With these seven tips, you'll quickly plug some of the holes in your fundraising efforts. In the video above, Steven Screen and Jeff Brooks walk you through some easy storytelling fixes you can make right now. Here's just a taste of what you'll learn in this special video. You will learn what THE story is.- This is by far the most important story. 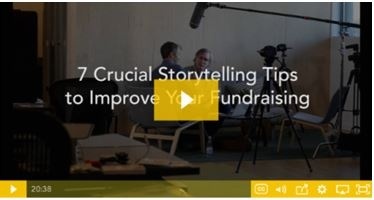 You'll learn about a type of story that will cause donors to complain...but will raise more money. What's the very first step to take when writing a story? - Jeff will tell you. You'll discover what the BIG lesson is that most nonprofits miss - and how companies like FORD benefit greatly from this lesson.